The event took place at Croke Park, Dublin. CYPSC member organisations shared the first year's progress of Dublin City North Children and Young People’s Plan 2018 - 2020 and the learning from featured projects that were designed to enhance a range of outcomes for children and young people. 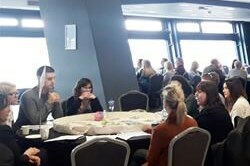 The event was attended by 60 representatives from a variety of statutory, community and voluntary services in the Dublin City North CYPSC area. the value of working together to improve outcomes for children and young people and commended the interagency working that is on-going across the area. and Tusla Educational Welfare Service. "In 2018, over 200 interagency stakeholders were involved in CYPSC actions, and an estimated 5,000 children and young people benefitted from CYPSC initiatives." A full description of these projects and an overview of progress can be found in Dublin City North CYPSC's newsletter. In highlighting the key actions and progress undertaken in 2018, development areas and plans for Dublin City North CYPSC into 2019, across each of the 5 National Outcomes Areas for children and young people, were also presented. A copy of the presentation is available here. In her closing remarks, Ms McGlynn congratulated all the agencies who have been involved in 2018, and welcomed other agencies to get involved in CYPSC projects and subgroups. The learning exchange enabled informal networking amongst services as well as time to develop shared ideas and understanding. Feedback from the event was very positive, illustrating that representatives found it helpful to learn about CYPSC projects and plans and to increase understanding of CYPSC and its objectives. Click here to read more about Dublin City North CYPSC. Click here to view Dublin City North CYPSC local resources.